The TF1 Omega Filter is the latest addition to the award-winning TF1 range from Fernox. It has a nickel-plated brass construction, meaning it meets the highest quality specifications and is designed to last. In fact, the Fernox TF1 Omega Filters come with a 25 year body parts warranty! It has a brilliant collection capacity for both magnetic and non-magnetic debris – first time, every time. It helps to extend the lifespan of a heating system, while optimising performance and efficiency. The The TF1 Omega Filter is ideal for installations where space and access areas are restricted thanks to the fact that it can be positioned horizontally, vertically and at a 45˚angle. The filter includes either high quality valves or slip socket connection and is available for 22mm or 28mm pipework. As with all magnetic products, if you have an implanted cardiac device extra caution should be taken at all times when handling any magnetic filter. 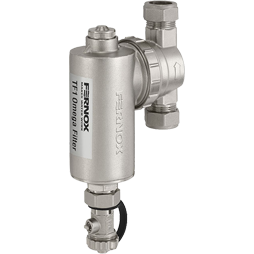 Interested in learning more about the Fernox TF1 Omega Filter? Are you a Gas Safe Installer?